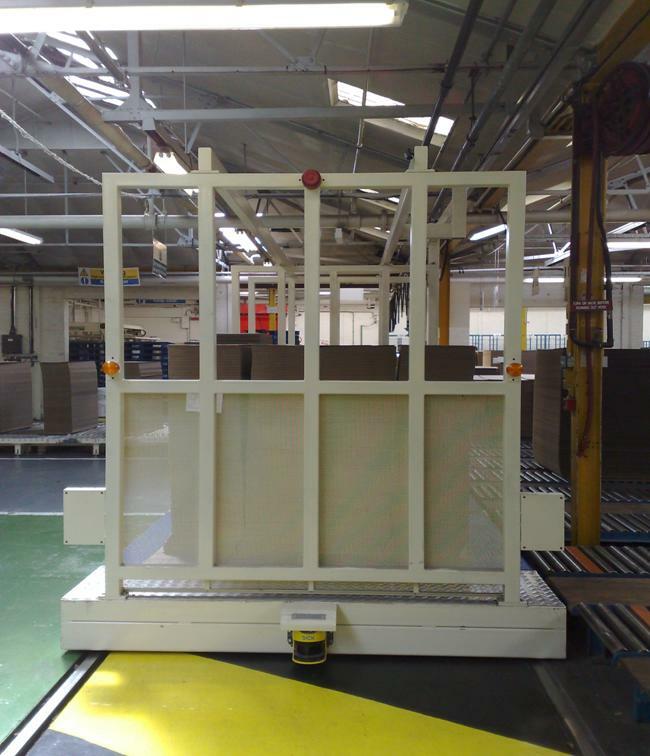 Automatic transfer cars for the Corrugated Board and Print Industries. Transfer cars are used to move loads between conveyor lines and are selected where loads need to be moved over long distances. They provide open aisles for pedestrian and maintenance vehicle access through the plant. Typical applications are the transfer of loads from Corrugator take-off to multiple storage lines, retrieval of board from storage conveyors through to converting machines and movement of finished goods from machine outfeeds to Strapping press. Dependant upon application Transfer cars can be fully automatic PLC controlled, operator controlled Man-Riding or totally Non-powered. 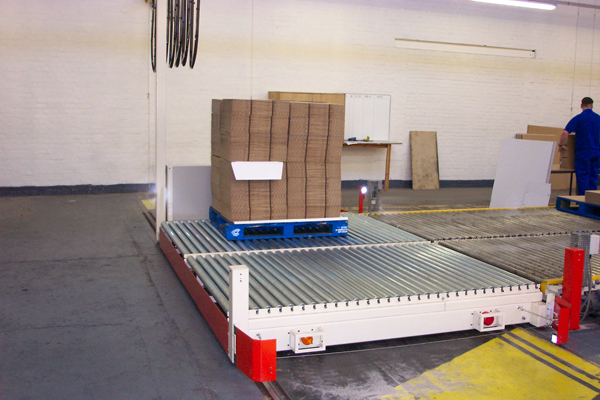 Transfer cars can have single, double or triple conveyor decks as required. 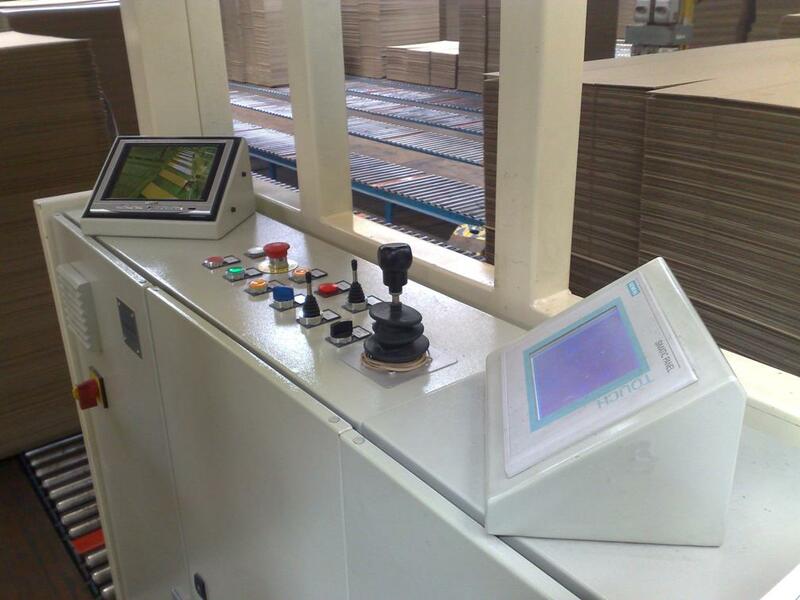 Independently driven reversible conveyor decks - load turning possible. Multiple polyurethane wheels for smooth running. Laser positioning system for car travel. Festoon system provides power and communication link to other equipment. Audible and visible alert to warn of vehicle movement. Laser scanners to automatically slow and stop car in case of obstacle. On board CCTV to give visual display of operator blind spot. Minimum height 310mm - top of rollers. Man-Riding cars - joystick control. Fully Automatic cars - PLC control. Shuttle cars are used to move loads between conveyor lines, generally over shorter distances than those covered by Transfer Cars. They are normally configured with a single powered conveyor deck which can be either roller conveyor or plastic belt conveyor. Equipped with soft start drive system acceleration and deceleration can be precisely controlled ideal for movement of narrow, potentially unstable, stacks. They are chosen over fixed conveyor where open access around machinery needs to be retained. Typical applications are the automatic transfer of single loads between conveyor lines, machine infeeds and infeeds to fully automatic Prefeeders.